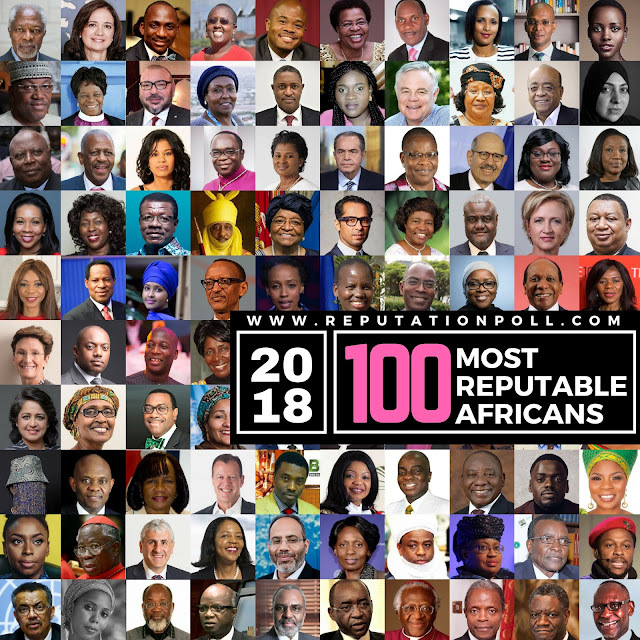 Leading Global Reputation-Management Consulting Company, Reputation Poll, has released its inaugural list of 100 Most Reputable Africans. The list which features individuals from diverse sectors including: Leadership, Entertainment, Advocacy, Education and Business has representation from 33 African Countries with 55 males and 45 females. The list of 100 Africans has Nigeria leading with 21 individuals with South Africa, Kenya and Ghana following respectively. 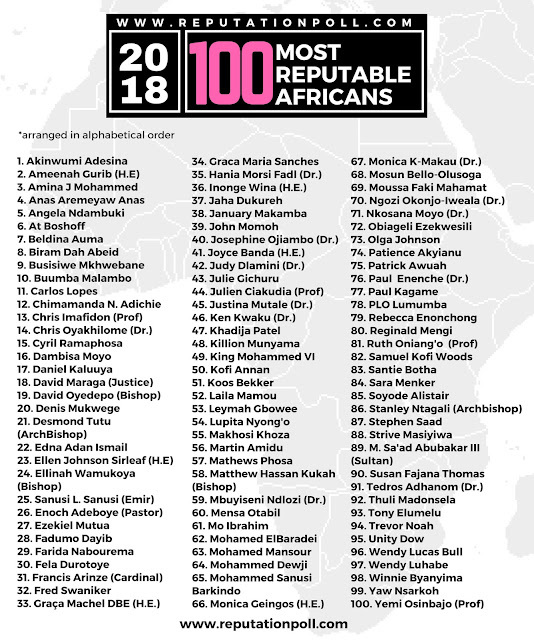 9 Ghanaians who made the list: Martin Amidu, Dr. Mensah Otabil, Kofi Annan, Dr Ken Kwaku, Yaw Nsarkoh, Anas Aremeyaw Anas, Patrick Awuah, Patience Akyianu and Fred Swaniker. 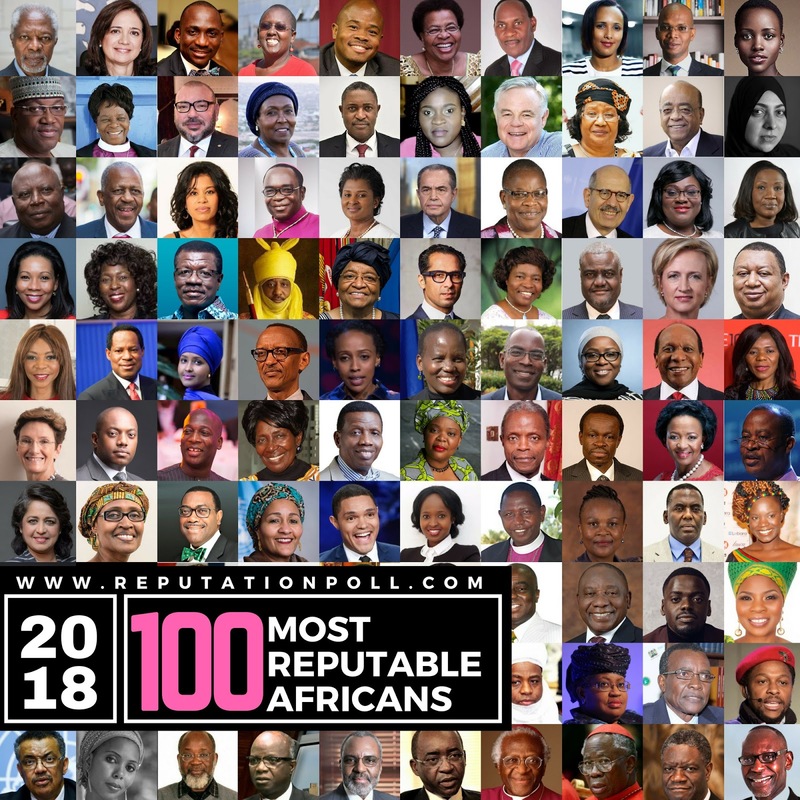 Very prominent personalities featured in the list include: Rwanda’s Paul Kagame, Nigeria’s Prof Yemi Osibanjo, South Africa’s Cyril Ramaphosa, and Mauritius’s Ameenah Gurib. In governance; the list features 3 African Presidents, 2 Vice Presidents, 2 former Presidents, a former Vice President, a First lady, Members of Parliament and Ministers. In Business; Strive Masiyiwa, Koos Bekker, Barclays Bank’s Patience Akyianu and Wendy Lucas Bull are represented for their works across Africa. For their fight against corruption are: Ghana’s special Prosecutor, Martin Amidu and South Africa’s Public Prosecutor, Busisiwe Mkhwebane. In Leadership; Dr. Josephine Ojiambo, H.E Graça Machel DBE, Dr Paul Enenche and Winnie Byanyima are also featured on the list. They are joined by others of less popularity but great potency in the vigor of their social impact, as well as Social Entrepreneurs who are transforming businesses in Africa and affecting lives positively without controversy. Reputation Poll which is known globally for its annual ranking of the 100 Most Reputable People on Earth and Most Reputable CEOs in various countries, is also set to be announcing new set of research works on personalities and brands across the globe. During the announcement of the list, the Board made mention of their continued focus and commitment in honouring individuals, Organisations and brands who consistently impact lives positively around the world and in Africa.